Following his return from the British Antarctic (Nimrod) Expedition of 1907-1909 Sir Ernest Shackleton toured the British Isles and Europe as part of an extensive lecture tour. He gave various lectures across Manchester and the North-West. 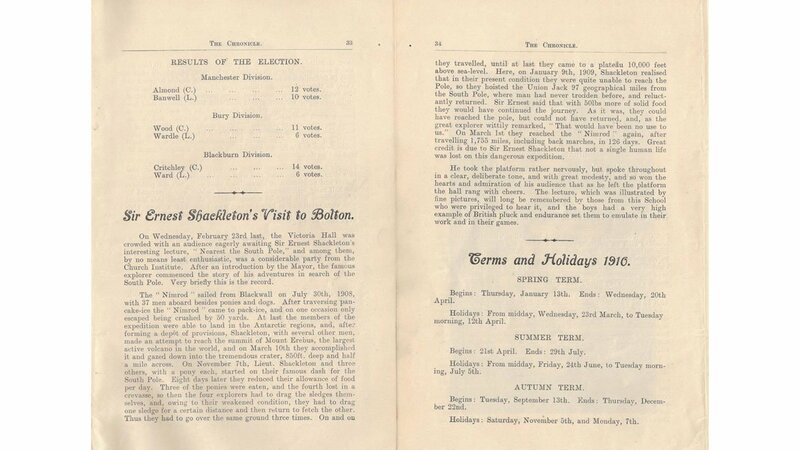 The oldest surviving magazine of the Bolton Church Institute School (now the Canon Slade School, Bolton), dated 1910, contains an article recording a visit by the boys of the school to an illustrated lecture, "Nearest the South Pole", by Sir Ernest Shackleton held at the Victoria Hall in Bolton. These extracts from the 'Institute Chronicle' show one way in which Shackleton publicised his exploits and sought to raise awareness amongst the people of Britain about polar exploration. Information and image supplied by Paul Dyson, Voluntary Archivist, Canon Slade School, Bolton.